NOSE: Flipside of the Sixpoint Bengali Tiger. In this one, the caramel malt sweetness and biscuity aroma take center stage. A touch of citrusy hops serves as a back-up singer. TASTE: Mimics the nose. Bread and sweetness dominate throughout the taste although a nice, subtle hop bitterness slowly worms its way out just before the finish. MOUTHFEEL: Medium-bodied. Moderate carbonation. No more. No less. DRINKABILITY: I guess this is Sixpoint’s flagship. It’s my least favorite of the four I sampled at Pub & Kitchen, but it’s also my least favorite of the four styles (I find blondes/goldens to be a little bland). Like the others, it does what it’s supposed to do and does it well. It’s not transcendent or particularly exciting. Just a solid, no-nonsense blonde. Like Joan Allen. Posted in Tasting Notes.Tagged Blonde Ale, Philly, Pub & Kitchen, Sixpoint, Sweet Action. So about a year after reading your tasting note, I finally had the chance to try this beer. I agree with you in general terms, but I’d suggest giving it another shot and making it your first beer of the day. 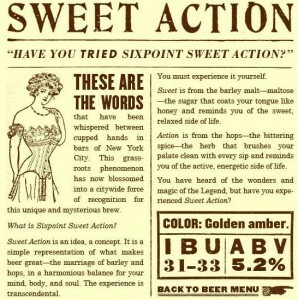 The brewery calls Sweet Action a cream ale. The only other self-described cream ales I’ve had (other than our brief misfortune with Genny Cream Ale in college, which hardly counts) are Spotted Cow from New Glarus and Summer Solstice from Anderson Valley. Sweet Action smokes those two. For a cream ale — which are typically brewed with little, and sometimes no hops — Sweet Action is really well-balanced. The aroma is invitingly floral. The taste is certainly subtle, but again, if you drink it before you tackle stronger-tasting beers, it does have a character, and it’s pretty unique. This reminds me of our disagreement about Bell’s Pale Ale. If you drink it fresh, and drink it first, it tastes good. If you drink it in between BORIS the Crusher and Dale’s Pale Ale, it’s just a waste of liver cells. One complaint about the Sweet Action–I drank it from a can (I mean, poured into a glass, but from a can as opposed to on draught), and got a persistent metallic aftertaste. Really wrecked it for me. I’m assuming you didn’t get that on tap. Definitely no metallic aftertaste on tap. It’s unlikely what you tasted came from the can (modern beer cans are lined with a coating that prevents the beer from making contact with the metal). Though it’s entirely possible the metallic flavor came from some aspect of the canning process (perhaps their filler needed cleaning) or some of the equipment they used in brewing. Alternatively, malted barley can sometimes spoil in such a way as to give beer a metallic flavor when you brew with it. Though that’s mostly an issue for homebrewers, not large, production-level breweries with good quality control.